Freediving is the purest form of diving. Learn the proper breathing techniques, familiarize yourself with diaphragm breathing and take a deep breath like you never have before. During the RAID Freediving Instructor course you develop and acquire the Proper skills and knowledge to partake in teaching professional Freediving to depths of 30 meters. The professional level courses are designed to make you the ultimate Instructor equipped with the abilities to teach in the 3 realms of Freediving, the academics, Confined Water and Openwater with the comfort and confidence expected from a professional level instructor, with the Freediving Instructor rating you will be truly internationally recognised as an expert rated to teach both WSF Freediver and WSF Advanced Freediving to the many future adventurists just waiting to take part. 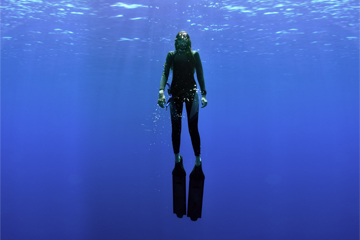 NOTE: Persons new to RAID freediving - this Level provides you with an international recognised professional Free diving Instructor certification to be able to teach freediving in a safe and concise way. This is the theory or academic section, which any person may take and complete, followed, without obligation, the Practical Section which is the session where you can learn, with your Instructor trainer, the underwater skills necessary for this level of training and complete your certification. When you purchase this programme on-line you are effectively purchasing the access for 6 months to the theoretical content, knowledge reviews and exam for this professional level of Freediver training, which consists of downloadable PDF manuals with detailed information. With your RAID Instructor Trainer you will develop and master your Instructional skills to deliver a successful program to student freedivers and to control/ manage groups safely in confined-water situations, give proper direction to achieve objectives, deliver briefings and de-briefings, the skills you develop here are paramount to delivering professional level teaching with confidence, fun, safety and success In the modern Freediving industry . With your RAID Instructor Trainer you will develop and master your Instructional skills to deliver a successful program to student freedivers and to control/ manage groups safely in open-water situations, give proper direction to achieve objectives, deliver briefings and de-briefings, the skills you develop here are paramount to delivering professional level teaching with confidence, fun, safety and success In the modern Freediving industry . With your RAID Instructor Trainer you will develop and master your Instructional skills to deliver a successful program to student freedivers in the most professional way possible, being a leader means making great decisions based on many factors to create a safe fun environment for people to learn freediving, this section will help you master your management, organisational and decision making skills, ultimately becoming the best instructor you can be . With your RAID Instructor Trainer you will have to perform all Freediving Skills at an Instructor level, your level of Skill reflects your Instructional capacity and must be perfect! Take the challenge and realise your dreams as you progress to a truly professional level Freediver under the guidance and coaching of your Instructor trainer, The in-water performance section can be challenging but is very rewarding, do you have what it takes? Certified RAID Master Freediver or equivalent.